White paper on crime 2004 Part1/Chapter1/Section4/1. Fig. 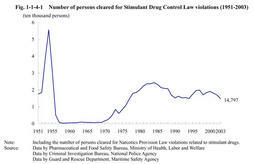 1-1-4-1 shows the number of persons cleared for Stimulant Drug Control Law(Law No.252of1951)violations(including Narcotics Provision Law violations related to stimulant drugs;hereinafter the same in this sub-section)since1951.Stimulant drug abuse began to become widespread during the chaotic postwar period,and experienced two boom periods until now.Persons cleared fell sharply after a peak at55,664in1954.Reasons behind this trend were pointed out that penal regulations were tightened in1954and1955,that clearance by police was implemented thoroughly,and that educational campaigns concerning the harmful influence of stimulant drugs were held nationally.The number of persons cleared took an upward turn again in1970and reached24,372in1984,entering the second boom period.From then,it fell below20,000in1989and decreased to14,896in1994.It started to increase again in1995and came to almost20,000in1997and2000,when it entered the third bo om period.However,it has not continued to rise,and decreased by2,167(12.8%)from the previous year to14,797in2003. 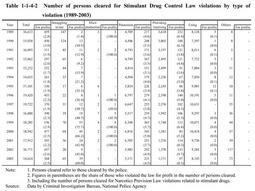 Table 1-1-4-2 shows the number of persons cleared for Stimulant Drug Control Law violations(only those cleared by the police)over the last15years by type of violation,as well as the number of those who violated the law for profit.In2003,the number of those cleared for drug use was the largest with8,143persons(55.7%),followed by those for possession with5,171persons(35.4%),which collectively accounted for more than90%of total persons cleared.Persons cleared for providing or receiving drugs fell below3,000in1992and2,000in1998,and have been within the1,000-2,000range since then. The percentage of those who violated the law for profit to total persons cleared has been stable between one and two percents every year other than1990when it came to3.0%.In2003,it reached2.5%.In the same year,of those who violated the law for profit,the largest was for possessing with231,followed by providing or receiving drugs with97. 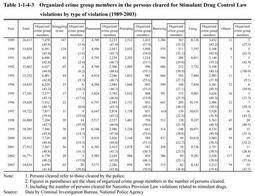 Table 1-1-4-3 shows the number of organized crime group members(regular and quasi-members of organized crime groups;hereinafter the same in this section)cleared for Stimulant Drug Control Law violations,by type of violation.The percentage of organized crime group members in total persons cleared has been almost between40%and50%,reaching41.4%(6,050persons)in2003.By type of violation,the percentage of group members was the largest every year for providing drugs,followed by possession,which indicates that they are deeply involved in illicit sales of drugs. Fig. 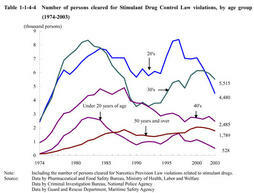 1-1-4-4 shows the number of persons cleared for Stimulant Drug Control Law violations over the last30years by age group.It indicates that those in their20s and30s are remarkably large groups.Those aged30-39were the largest from1977to1984,and subsequently,those aged20-29were the largest since1985,but again those aged30-39have been the largest since2002.Juveniles under20were over2,000from1980to1985,but declined to528in2003after repeated fluctuation.Those aged50or over have always been over1,000since1982,surpassing2,000in2000and2001.However,they have been below2,000for the last two years,coming to1,789in2003. 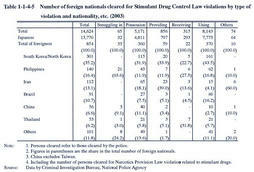 Table 1-1-4-5 shows the number of persons cleared(only those cleared by the police)for Stimulant Drug Control Law violations in2003,by type of violation and nationality,etc.Foreign nationals were854,accounting for5.8%of the total.By nationality etc.,South/North Koreans had the largest number with301persons(35.2%),followed by Filipinos with140persons(16.4%),Iranians with112persons(13.1%),and Brazilians with91persons(10.7%).By type of violation and nationality,etc.,most South/North Koreans and Brazilians were cleared for drug use(53.5%and65.9%,respectively)whereas most Iranians and Chinese were cleared for drug possession(58.0%and71.4%,respectively). Table 1-1-4-6 shows the number of persons cleared for offenses rooted in stimulant drugs since1989.Persons cleared increased from1995to1997,but have decreased since then to80in2003.By type of offense,breaking and entering was the largest,followed by Firearms and Swords Control Law violations,and theft in2003. (2) Narcotics Control Law violations,etc. Fig. 1-1-4-7 shows the number of persons cleared for Narcotics Control Law violations(including Narcotics Provision Law violations related to narcotics and psychotropic substances;hereinafter the same in this sub-section),Opium Control Law(Law No.71of1954)violations(including Narcotics Provision Law violations related to opium;hereinafter the same in this sub-section),and Cannabis Control Law(Law No.124of1948)violations(including Narcotics Provision Law violations related to cannabis;hereinafter the same in this sub-section). 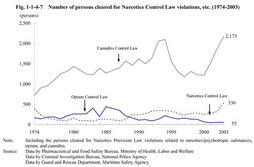 Persons cleared for Cannabis Control Law violations rose overall to2,103in1994.Then they fell sharply but rose again rapidly since2001,and reached2,173in2003more than the peak of1994.Persons cleared for Narcotics Control Law violations have risen since2001to530in2003,a62.1%(327)increase from the previous year. Fig. 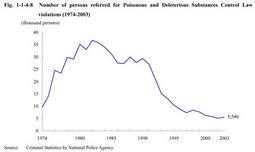 1-1-4-8 shows the number of persons referred for Poisonous and Deleterious Substances Control Law violations since1974.Persons referred were between30,000and40,000since1980and peaked at36,796in1982.They then generally decreased below10,000since1996,to5,546in2003.